A walk through Geneva airport brings us to the railway station, where we find a direct train for Lausanne. My husband and I are spending a week in Switzerland, staying in the old part of the city. The May weather is warm with sunshine and spells of rain. 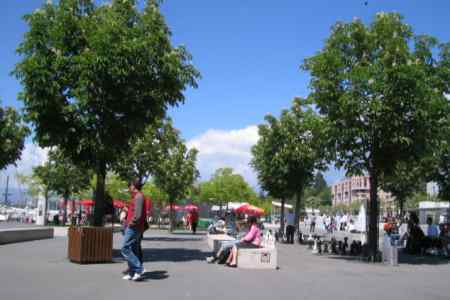 Near our hotel is the Place de la Riponne, a large square where weekly markets are held. On one side of the square is the Palais de Rumine, which houses several museums. It is raining, so we go there to view the pictures in the Musée Cantonal des Beaux Arts. We walk from the Place de la Riponne down the Rue W. Haldimand passing several cafés and tea rooms and stopping off at a “sandwicherie” to buy fresh sandwiches. Maybe we will visit a couple of museums or a chateau or two, potter round the local markets, go for cruises on the nearby lake or even venture a little further afield if the mood takes us. The Rue du Grand Pont leads us across a suspension bridge with a busy street on the level ground far beneath. Many of the older streets and buildings in Lausanne have been moulded to the ledges, clefts and outcrops on the slopes of the mountains rising from the shores of Lac Léman, also known as Lake Geneva. Across the main road outside Lausanne railway station is a narrow street opposite the station entrance which leads to the old part of the city. This street, the Rue du Petit Chêne, is half hidden by the buildings on both sides, its entrance marked by a McDonald’s restaurant. The Metro ticket machines do not give change, so we make for the Lausanne Tourist Office next to the railway station to buy tickets for the Metro to Lausanne-Ouchy. The wide blue sweep of the lake dazzles our eyes as we emerge from the Metro station at Ouchy. Yachts and excursion boats are moored by the quays along the lake shore. On the right an artificial canal runs straight along a strip of land by the shore to end abruptly near the entrance to a fairground. It is bisected by a line of fountains and crossed at intervals by low bridges. To the left players pore over open-air chessboards. Nearby is a small park with trees and flowerbeds laid out in formal designs, including one showing a clock. We make for a bench by the lake. Cyclists and skateboarders flash past us. Families and couples are strolling along the paths or sitting by the lake on stone walls or on the benches lining the paths through the park and along the shore. We sit on a bench eating our sandwiches and looking across at the opposite shore, where gauzy veils of mist in delicate shades of blue cover the jagged peaks of the French Alps. We go again to Ouchy to visit the Sunday market there. This offers a wide choice of locally produced breads, meats, cheeses, fruit and vegetables. We buy olive bread, goats’ cheese and kiwi fruit for lunch, washing them down with beer and lemonade from a small supermarket nearby. Afterwards we walk on a path next to the main road towards the Olympic Museum a short distance away. This has been built on the side of a slope rising upwards to our left away from the lake. A small gate by the road opens on to gardens, laid out with low hedges, shrubs, flowers and statues with an Olympic theme and criss-crossed by paths. A steep path and slowly moving staircase lead directly to the main entrance of the museum. The Olympic Museum, inaugurated in 1993, was built to commemorate the official award of Olympic capital to the city of Lausanne by the International Olympic Committee, which was founded by Baron Pierre de Coubertin. Exhibits illustrating various aspects of the Olympic Games are shown against a backdrop of ultra-modern state-of-the-art interior and architectural designs, which use light, space and the latest technological developments to set off the displays to the best advantage. It is a weekday. We opt for a leisurely boat cruise along the lake shore to the Chateau de Chillon and buy a return ticket for the 12.30 boat from the booking clerk at Ouchy, who also gives me a timetable. He finds it unnecessary to point out that only the first of the two sailings shown from Montreux to Ouchy at 16.20 and 17.30 hours actually operates during the week. Our boat departs. There are frequent stops along the way – at Pully, 5 minutes after leaving, to allow a group of schoolchildren to disembark, and at Vevey and Montreux, where tourists go to visit the open-air markets. Finally we reach the Chateau de Chillon. Some other people get off with us and one of them, a Japanese American girl, takes our photo on the bridge in front of the Chateau, which stands on a rock. Over the centuries the Chateau de Chillon was held by the Counts of Savoy, captured by the Swiss from Berne and finally passed into the hands of the Canton of Vaud. The poet Byron (“mad, bad and dangerous to know”) visited the Chateau, saw the prison where Bonivard had been kept chained to a pillar for 4 years and went home to write a poem “The Prisoner of Chillon” that same evening. Afterwards a guide at the Chateau points out a clearly-marked path leading by the lake back to Montreux, home to many famous people over the years. We walk along the path, stopping from time to time to look through the leaves of the trees along it for a glimpse of the mountains on the opposite shore. There are still 10 minutes to go until 17.30 hours when we reach the quay at Montreux, but no-one is waiting there. I ask in the nearby Tourist Information Office when the boat is due. “There is only one boat to Ouchy today and it has already gone”, he says. I show him the timetable and he points out that the 17.30 boat only operates at weekends and on public holidays. At his suggestion we go to the train station at Montreux to find out whether we can use our tickets for the boat to travel by rail. We are in luck and take the next train back to Lausanne. Later that evening we eat at one of the two Manora restaurants that we have taken to patronising. Both offer a wide selection of self-service meals in varying sizes to suit one’s appetite and are open in the evenings. Taking the waters in a thermal spa is wonderfully relaxing. This is reason enough for us to visit Evian-les-Bains on the lake shore directly opposite Lausanne. We travel by boat across Lac Léman and are soon in France, using euros instead of Swiss francs. The thermal spa building is on a hillside overlooking the lake, 5 minutes’ walk from the quay at Evian. We sit in the reception area sipping Evian water from paper cups. Tables, chairs and sofas are scattered about the hall. There are two fountains with Evian water on tap and leaflets and brochures on display stands nearby. 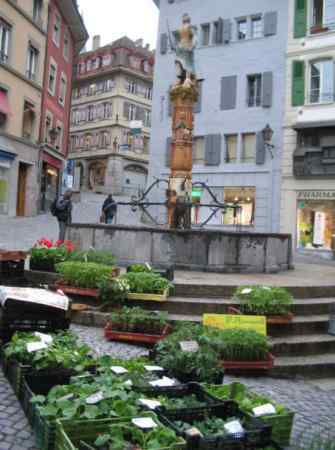 My husband and I walk slowly along the narrow main street with small shops on either side selling souvenirs to the main square with the Town Hall on one side and a street to the right sloping down to the lake shore. On the way back we turn right to take a narrow road up a hill to the next level, where another street, the Rue des Sources, runs parallel to the one we have just left. Next to this street is a wall of rock with water gushing continuously from a hollow inside the rock, which is framed by a stone surround. A queue of people carrying empty bottles and containers stand nearby, waiting to fill them with Evian water from the original source, the healing properties of which were first discovered in 1790 by the Comte de Laizer, who came from the Auvergne in France. We round off our day with a stroll along the shore to the Fontaine Musical (musical fountain). before taking the late afternoon boat back to Lausanne. A large map of the region round Lac Léman offers us a wide choice of places to visit for our last full day in Switzerland. 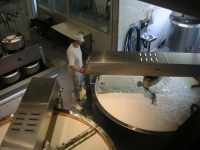 We decide to go to Gruyères to see the cheese factory and chateau there. An Intercity train takes us to Palézieux, where we board the small regional train painted orange and black with “Gruyères” in large letters on both sides. It takes us along a narrow gauge railway winding through a valley, past partly wooded slopes, scattered chalets and green meadows with cows grazing on them. Snow-covered peaks can be seen in the distance. Apartment blocks begin to appear as we reach a built-up area, passing through Bulle, the administrative centre, before arriving at Gruyères station right next to the cheese factory. The small museum inside the factory shows the stages of cheese production from the cow right through to the processing plant. Our English-language version of the multi-lingual audiotapes has Cherry the cow giving a commentary as we walk past the display. The cellars of the cheese factory next door have huge wheels of cheese stacked on slatted wooden shelves from floor to ceiling. The cheese restaurant is a large light-filled room with a bar serving food along one side of it and doors opening on to a terrace. We sit at a table and study the menu, which features dishes using the numerous varieties of cheese produced on the premises. Our lunch consists of onion soup blended with grated cheese served with freshly baked bread, followed by vegetables freshly prepared in a colourful salad and a plate of 5 different cheeses. The factory shop sells more cheeses and regional food products as well as other souvenirs. A tiny train outside the factory takes us slowly towards the village of Gruyères. Our driver tells us about the region in French and English as we travel along the narrow road with views of mountains and valleys on either side. The ancient buildings on both sides of the village streets house restaurants, museums and souvenir shops, their contents overflowing on to the paths thronged with tourists. Our train leaves us in the small market square. 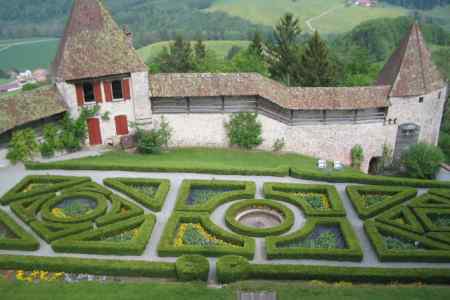 The Chateau de Gruyères lies straight ahead of us through a gateway and past a courtyard with a museum to the right. It is smaller than the Chateau de Chillon. 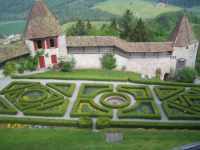 Numerous staircases lead us all round the chateau through numbered rooms and inner courtyards to a sentry room. There is a large vault with a hangman’s noose nearby. Afterwards we catch the mini-train back to the station by the cheese factory, returning to Lausanne later that evening. The following day, refreshed, rested and relaxed, we leave Lausanne for Geneva airport. Admission is free to many museums in Lausanne on the first Sunday of each month. Metro tickets can be bought at the tourist offices near Lausanne railway station and at Lausanne-Ouchy. They remain valid for 30 minutes after purchase. The Metro ticket machines do not give change. If you enjoyed reading the above article then you will probably also enjoy Munich by Ann Quadri, and Iceland, also in Europe, and our latest articles covering the Orinoco Delta, La Mata, Marbella and Beijing.